We eat quite a bit of pasta. Sometimes twice a week in various guises. 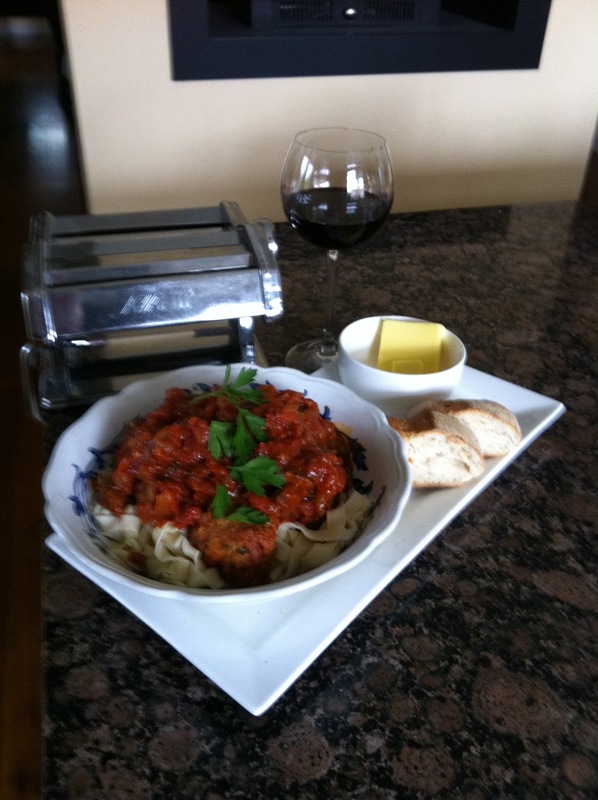 Our fav - the quickest and easiest is spaghetti or fettucini with a meat Bolognaise sauce. I had never made my own pasta until last year, I don't think I would go back to having shop bought as I think fresh homemade is just something else. And I was amazed at how simple it is. On a trip to England last year my daughter and I had a few days down in Brighton. I hadn't been to Brighton for years. I really love it. The architecture, the Palace, the Lanes, the little restaurants and tea rooms, the Pier and the rock. We didn't think we needed to pre-book anywhere to stay, we would just book something when we got there. What a mistake that was. It was like trying to find a room at the Inn and we were nearly ready to take a stable. We had my granddaughter with us at the time who was only a baby then, which proved to also add to our woes as some of the lovely little bed and breakfast places said "no children"! Anyway we later found out that a Union Convention was being held over the weekend and every room was booked. We ended up taking one room here and one room there but it didn't dampen our weekend. It had become an adventure. On the Saturday night we booked a pasta masterclass at Recipease a Jamie Oliver cafe, larder and demonstration kitchen. It was such good fun. 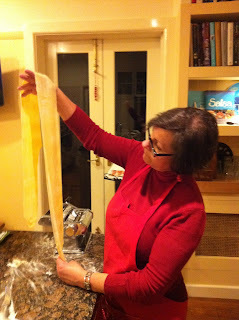 A small group worked together in the demo kitchen and then we ate our own cooked pasta and a glass of red afterwards. I haven't looked back since. And I have passed my new learnt skills onto all sorts of men women and children. In a bowl mix the egg into the flour with a knife until all the flour is mixed (the last scrapes can be drawn together with your hand). Turn the dough out onto a floured bench and knead the dough for a few minutes until it is smooth and the gluten is released = bounces back when pushed with a finger. Flatten the dough so it can be fed through your pasta maker. 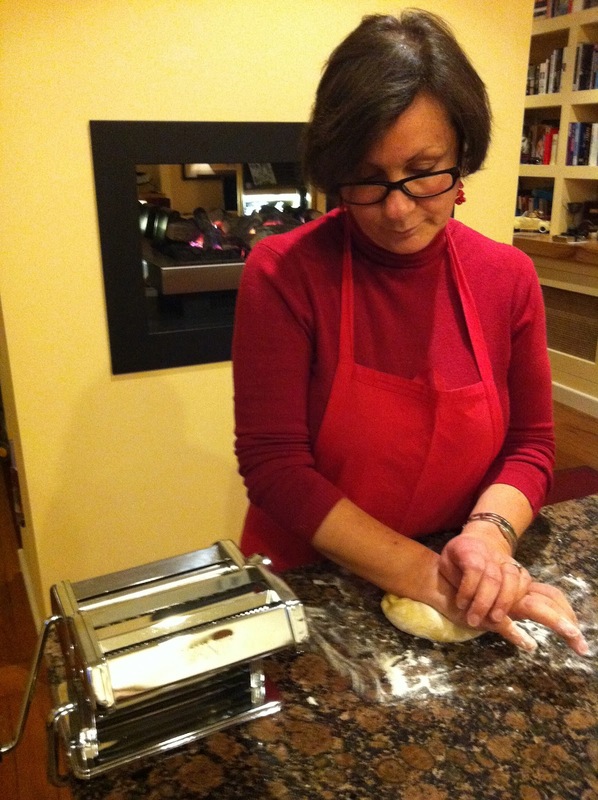 With your pasta maker dial on No.1 feed the dough through the wringer. Gradually increase the dial number so your dough becomes thinner and thinner. Keep your dough well floured between each dial increase. I generally don't go past No. 7 on the dial and I feel this is thin enough. The cutting part of my pasta maker has two sizes - one for spaghetti and one for fettucini. If you wanted it thicker you could cut it by hand. If it breaks or falls apart don't worry just re-roll it. Uncut pasta sheets are perfect to make lasagna as you can cut the sheets to what ever length that suits your dish. While you are making your pasta put a large pot of water on to boil. Add salt - this helps to keep the pasta from fraying and becoming to soft on the outside. It will need to be bubbling madly before you throw in your pasta. 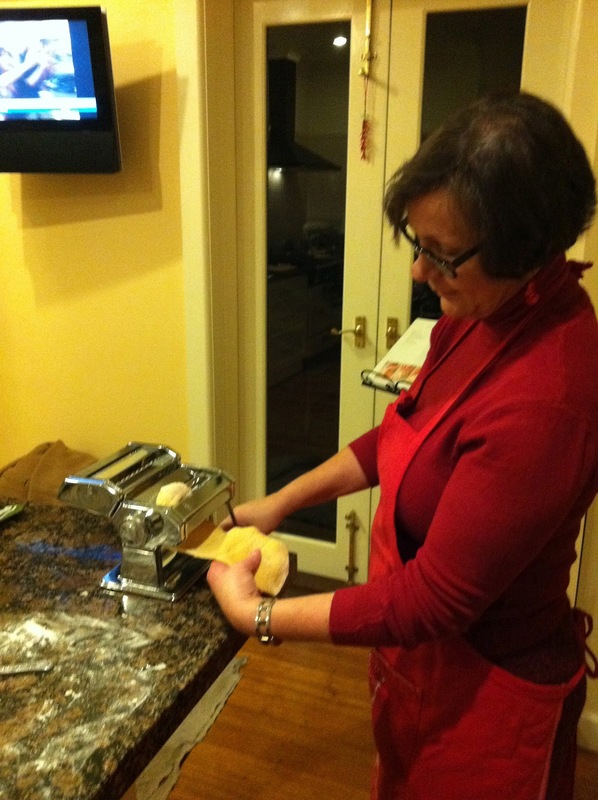 Remember while you are working with your pasta make sure you keep it well floured - this will stop it sticking together. 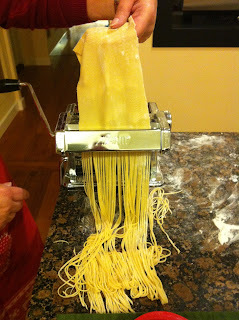 Fresh pasta only takes a few minutes to cook so don't walk away and leave it. Taste a strand as soon as it starts to float to the top of the pot. Strain when it is cooked to your liking. Don't rinse. Serve immediately with your sauce of choice. And there you have it perfect every time! 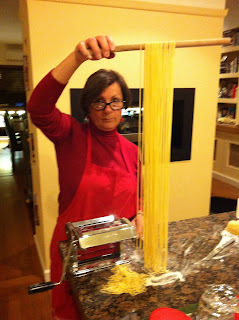 love those pictures... and look at that finished pasta... you are a marvel!!... I do not have a pasta machine and i've never made my own, something that I must remedy this year... thanks for the inspiration! Dom once you have made your own you will never look back - bit like making your own bread! I wish mine was perfect every time! Somehow that dratted machine never does what I want it to do. I'm going to resort to rolling and cutting by hand. Well I think you should persevere with your machine (but with patience). 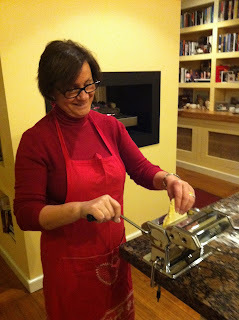 Then again some older italian ladies I know still roll and cut their own and swear by it! Thing is not to be in a hurry. Wow! It looks perfect! I would love to try and create my own sometime. I was always hesitant cause I thought it would be hard. I wish we had master classes here. Maybe we do but just don't know it. 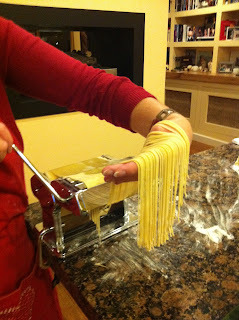 I always hankered over making my own pasta because I thought it was difficult - not so. Just takes a little time, probably 30 mins to prepare and less that 3 mins to cook! I've been planning to have a go this week too...looks like fun. Good for you - let me know how it turns out. Come on get that angel hair pasta made at home! My pasta maker is borrowed from my daughter who has never used it either! Lovely photos. I do LOVE home made pasta, but rarely make it. Thanks Vanessa, I'm hardly surprised with your busy schedule. Yes takes a bit of prep and you have to be in the mood, but the taste I think is so much better - or is it just the fact that you have made it yourself that makes you feel so much better. As you say great minds! I love your instructions, your pasta looks a darn sight more perfect then mine, but it is such fun to do, I'm going to show my daughter your photos tomorrow! 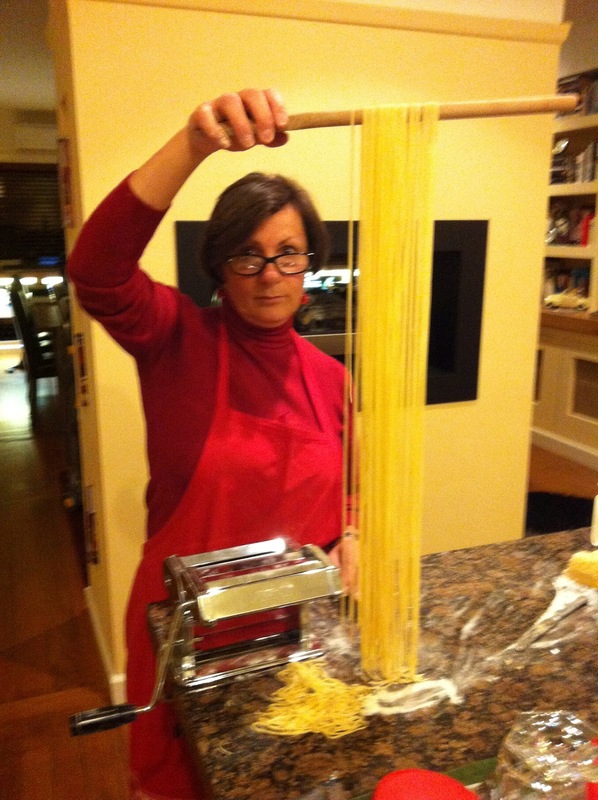 I have made this pasta with my grandchildren and they think its fun too! That's the important part. I love this post! What great instructions you have given too. 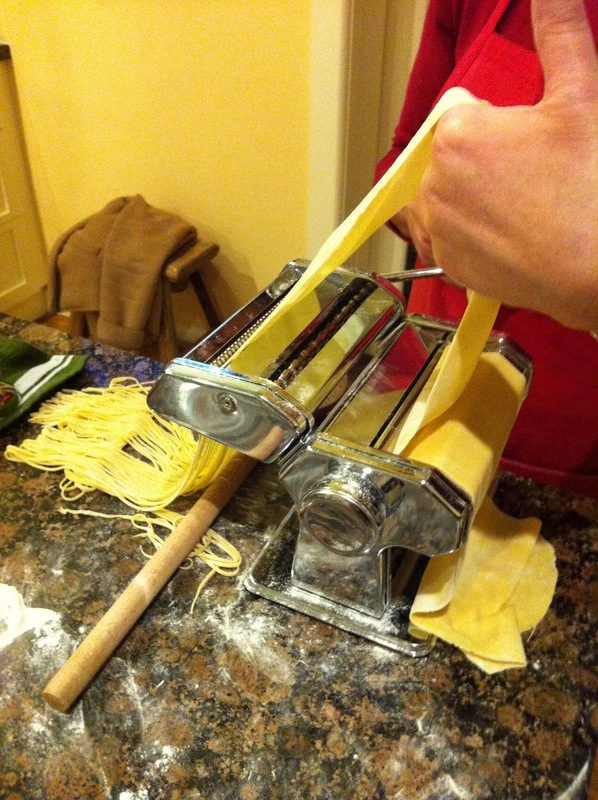 I've never tried homemade pasta. I have it on my list of things to try, but not anytime soon. Yours looks perfect! Thanks Mary. Oh go on give it a go! GG have a good look at pasta makers as the more expensive ones are worth the money as the cheaper ones can be very tinny and very annoying when they don't work smoothly. I have used both, both belonging to my daughters who have never used them ! !Having said that there doesn't seem to be very much difference in that middle price range.